Lawn Aeration and over seeding is generally recognized as the most important annual lawn service for existing turf. Aeration allows water, fertilizer and air to penetrate the root zone. 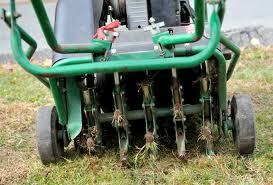 Aeration is the process of mechanically removing plugs of thatch and soil from the lawn. Aeration opens the soil, helps reduce compaction and creates a good environment for over seeding. Lawn aeration and over seeding promotes deeper root growth. Setting the foundation for a lawn that is greener, healthier and drought resistant. Lawn aeration and over seeding is one of the best things you can do for your lawn. Call today about this important lawn service.